It started out as an idea for a live video chat app that let English learners practice with native speakers without having to attend an in-person session. 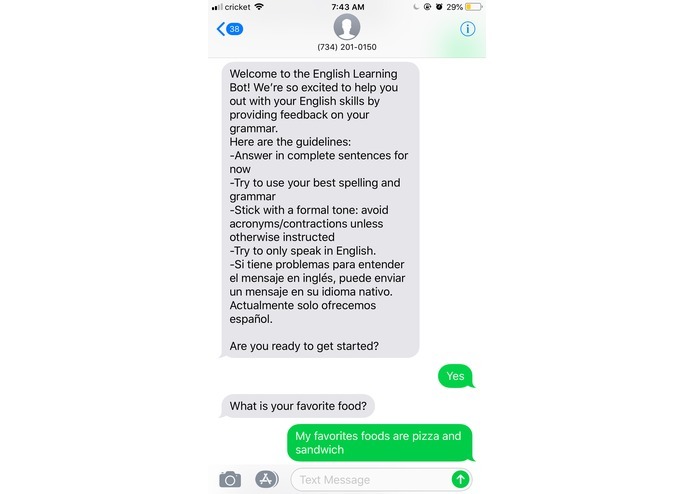 It transformed into a chatbot that allows English learners to practice texting through a bot. Using Twilio software, we incorporated their programmable SMS API to create a bot that could chat directly with users with their phones. From there, we used a grammar API, as well as a Google cloud translation platform so responses from the user could be edited (for spelling, grammar), and if needed, words or phrases could be translated. We spent hours trying to download and start Maven, even though we never even ended up using it. We also had problems with trying to download the pip installer and the grammar API that we incorporated. We also had to learn how to use Twilio and Google Cloud Platform for the first time. After many hours of searching for appropriate methods & tutorials, we were able to make our Twilio SMS messages into auto-generated questions, and let the user's response become a variable that we could manipulate. 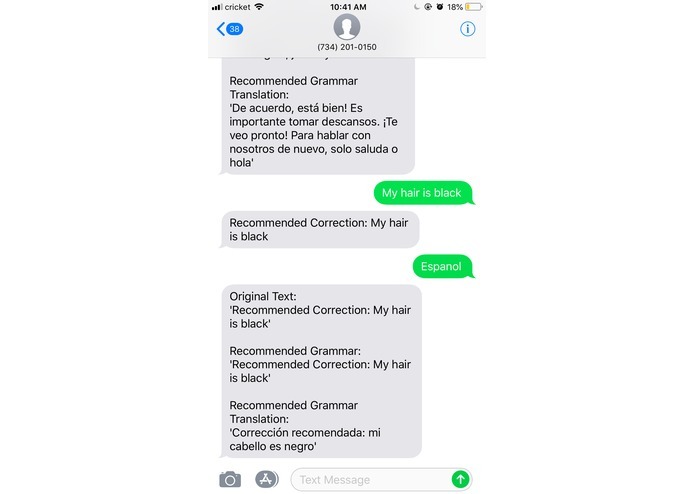 We are very proud of being able to integrate our Twilio related code with our translated and grammar checking code. Not only this, we were able to improve upon an already existing grammar API, so that it was more functional and specific to our mission. In general, we learned that being unsure of the goals for the final project, in the beginning, is okay because as we did more research, feasible goals for the time frame became a lot more clear. In order for Bilingual Bot to fully serve immigrants that are new to America, and specifically, who are newcomers to NYC, we want to be able to offer them other resources besides English-help. For instance, providing them with a way to get directions in their native language, and translate streets & addresses. Another idea was to ask if they were interested in learning more about the free resources available in NYC, such as public libraries, movie nights and parks near them. I worked on the Twilio integration using Python Flask.